From left to right: Alex George, CJ Hall, and Nic Parsley. The old saying is one that is cliche, but true: football games are won and lost in the offseason weight and conditioning programs that each team participates in. It’s also cliche that football games are won and lost in the trenches. For the Wheelersburg Pirates’ football program, senior linemen CJ Hall, Nic Parsley, Alex George, and Caleb Browning represented the best of the best as far as play in the trenches were concerned. If 6,022 total yards of offense, along with a defensive unit that forced teams into 26 sacks, 19 interceptions, 13 forced fumbles, 11 fumble recoveries and held teams to just 2.6 yards per carry and 2,541 total yards in 2017 doesn’t prove that, then nothing will. College coaches certainly took notice of the quartet’s play and leadership in said area on one or both sides of the football, as Hall, Parsley, and George signed with Mid-South Conference member and NAIA unit Pikeville, while Browning inked to play football at NCAA Division III Marietta College as four of the Pirates’ most integral members in the trenches all will play from the 2018 season on forward. For Rob Woodward, the play that all four players provided during their football careers at Wheelersburg, and most importantly, their attitude, is something that he certainly won’t forget when referring to each of his star hands. 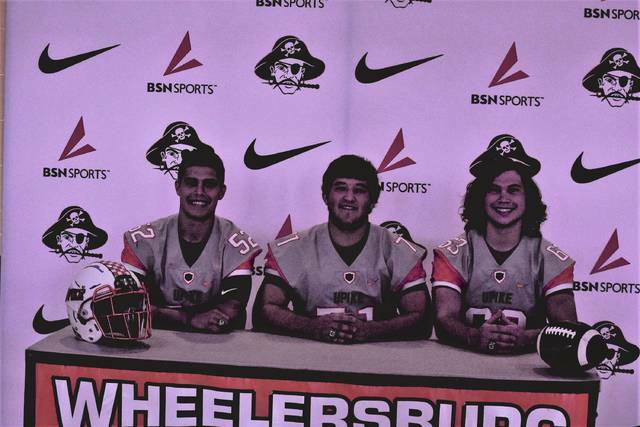 For George, Hall, and Parsley, Pikeville — who has already developed a Wheelersburg pipeline of sorts — was a natural choice for the pair, who signed with the program in February and ultimately held their signing ceremony on May 3 at Wheelersburg High School. Parsley, who finished second on the Wheelersburg roster with 101 tackles, led the Pirates with six sacks, obtained three quarterback hurries, and deflected a pass in 2017 to head the charge on the defensive line en route to First-Team All-Southeast District and First-Team All-Ohio honors. He’ll follow his older brother, Cam — who finished his UPike career by collecting 104 tackles and six sacks in his final pair of seasons as a Bear — and fellow sibling Eddie Miller III in the family tree at UPike. George, who made 63 stops and collected three quarterback hurries, a forced fumble, and a sack, and Hall, who added 55 stops and a sack of his own, were Wheelersburg’s two most dependable linemen on both sides of the gridiron as the pair played in all 15 games on each side of the trenches. Hall was widely regarded as the Pirates’ most complete offensive lineman, while George’s quickness as an offensive guard and as a flexible defensive lineman made No. 52 an extremely hard cover in 2017. Both earned All-Southeast District honors, as well. Browning, who, like Hall, was a dependable presence at offensive tackle, also started all 15 games for an offense that set records in passing yardage and touchdown passes in a season while also blocking for an offense that accumulated 2,444 yards, five yards a carry, and 40 touchdowns on the ground. The senior ultimately allowed the Pirates to garner 87 touchdowns on the year.